I have to say… I have not been a huge fan of this vampire arc in the Avengers book. The addition of Blade to the roster was interesting at first, and I did like how they have taken the group to a new location with the Agents of Wakanda becoming a thing, but, if I am being honest, I just did not care much for the Dracula arc. It did not raise to a level that I had hoped it would, and that it tough, especially when Avengers: No Road Home is killing it every week. So this “finale” of this story (though not that much has been wrapped up) remained as a weaker issue of the series. I felt very unconnected to most of the characters and, even with a neat last page, I just did not find much engagement with it. Not only was I fairly disappointed with the Dracula aspect of the story, I an finding, more and more, that I really do not like the current form of Jennifer Walters, aka Hulk (don’t call me She-Hulk). As one of the best female Marvel characters for years, Jenn is simply nowhere near as interesting in this form as she should be. 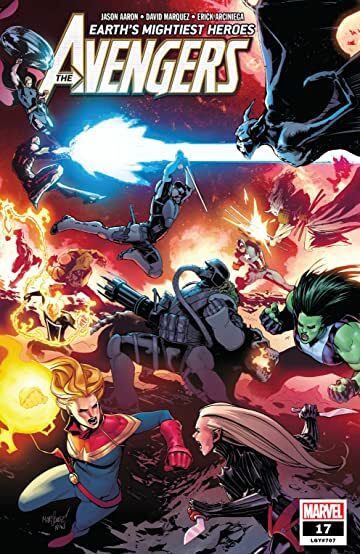 With the War of the Realms coming next month, this arc certainly takes a back seat to what is coming, but it feels underwhelming and unfinished. I’m not sure Blade or Ghost rider fit in the Avengers and I actually had a bit of a negative reaction to Blade yelling “Avengers Assemble.” I do like the attempt to re-brand the Russian team, the Winter Guard and their budding rivalry could go somewhere. However, this story arc will be forgotten before that comes to pass.